Need a hat for those long, hot afternoons on the river? Check out our all new, microfiber, 6-panel, low profile fishing cap. 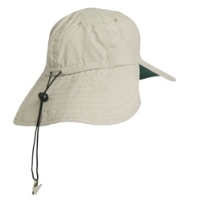 This hat has everything except the kitchen sink: back neck flap, elastic cord for adjustable fit, a collar clip, and green underneath the visor for added sun protection. And if you happen to drop it in the river, this hat is made to dry quickly.